On the face of it, the Humber Stone is just a chunk of rock. Estimated to weigh a whopping 20 tonnes, it’s a large, isolated stone, standing in Sandhills Avenue, off Thurmaston Lane, Leicester. But for hundreds of years, myths and legends have been attached to this weird, and once prominent, feature of the Leicestershire landscape. Some of the tales are fantastical, to say the least. They say there’s no smoke without fire – and it could be there is a grain of truth in some of these tales, linked to the theory that this half-forgotten stone was once a site of great significance to our ancient ancestors. Myth and legend has added scores of details to this prosaic background. 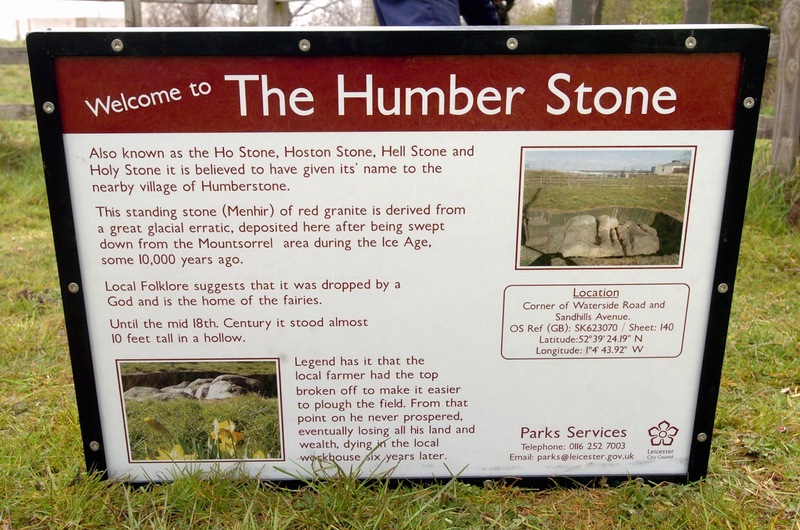 Throughout history, the Humber Stone has loomed large in local tales – partly because it was once dramatically sited on the crest of a ridge. Down the years, the Stone had various names, such as Hellstone, Holystone, Hoston and Holston. The stone was also important enough to influence the naming of the nearby community and local fields. To the east of the stone, the field was named Ost End, and to the west – West End. There’s even a curse of the Humber Stone, which dates back centuries. “Boy drew creature that stood beside his bed” was a Leicester Mercury headline as recently as 1980, when a 10-year-old boy, living close to the Humber Stone, had constant “visits” from a devilish entity. It was, apparently, a creature with a goat’s head and long curving horns, a man’s body and cloven hoofs. After drawing it at school, the boy’s teacher asked what it was. “I don’t know, miss”, he said. “It’s the thing I sometimes see at the end of my bed”. The family left Leicester not long after the drawing was made, but the same house was then occupied by the boy’s grandparents. A month later, the Leicester Mercury proclaimed “Humberstone ghost tried to choke me”. The grandmother of the unnamed boy said: “I was roughly awakened, feeling that my life was being choked out of my body”. The house in question was close to the Humber Stone. 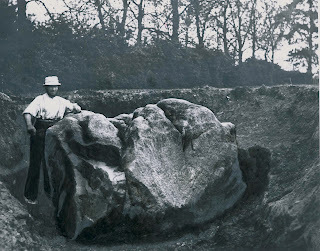 In John Harrison’s booklet The Mystery of the Humber Stone, he tells the story of a farmer in 1925 who decided to build a haystack on the stone. The stack burst into flames. The fire brigade was called but as soon as they had extinguished the fire and left, it burst into flames for a second time. This time the hay continued to burn for three days. The villagers said it was due to “the curse of the Humber Stone”, because it had been defiled. The stone must always be left to rest in peace. Between 1756 and 1766, the upper parts of the stone were broken off so that a plough might pass over it. The owner of the land who did the deed “never prospered afterwards” apparently. He was reduced from being the owner of about 120 acres, to absolute poverty, and he died in 1810 in the parish workhouse. A tale from the English Civil War says a group of Royalists were captured by the Roundheads and imprisoned in St Mary’s church in Humberstone village. They escaped from the church via a secret passage, to emerge in a field just by the Humber Stone. When the Roundheads finally discovered it, they levered the Humber Stone over the entrance to the passage, to stop anybody from using it again. We actually know that Humberstone church had a passageway to the nearby (but now demolished) Monk’s Rest, but we don’t know if there’s a tunnel underneath the Humber Stone itself. You should take all these tales – and many more like them – with a pinch of salt, of course. But the fact remains that the Humber Stone has loomed large in local legends right down the centuries. The 19th century writer John Dudley conjectures that all these strange tales stem back to the stone’s ancient use – as a sacrificial altar. We’ve already mentioned that the stone was previously known as Hellstone. Hela, Dudley says, is the Saxon word for death. He adds that standing stones on hills or ridges, like the Humber Stone, “were usually chosen for the celebration of religious rites of the ancient British. There seems to be little room for doubt that Hoston (the Humber Stone) was once sacred to the purposes of druidical, or rather of the more ancient bardic worship”. Dudley believed that Humberstone village acquired its name from the stone, for the places used for ancient bardic worship were known as Homberds or Humberds. Humberstone, he believed, was plainly the ton, or town, of the Humberd, or place of bardic worship. The village is situated half-a-mile from the stone. This is as near as habitations seem to have been allowed to approach these sacred places, where sacrifice was commonplace. There is a link too with another Leicester standing stone. Another remnant of Leicester’s ancient past is St John’s Stone, which was situated close to Leicester Abbey, in a field once known as Johnstone Close. 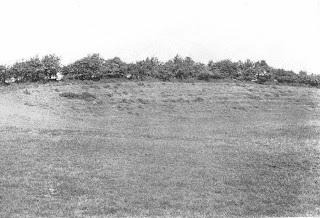 It sat next to a hillside that had been worked by man to create a large horseshoe-shaped amphitheatre with seating. 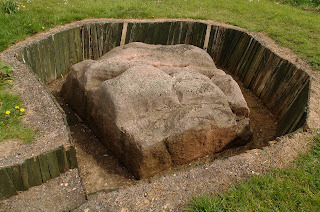 The St John’s Stone stood tall in the middle of the enclosure. At the beginning of the 19th century it was about seven feet high, but by the year 1875 it was worn or buried down to about two feet high. It has since completely disappeared. A drawing of the stone, made by Mr J Flower in 1815, can be found in William Kelly’s Royal Progresses and Visits to Leicester, of which Leicester Reference Library has two copies on display. Like the Humber Stone, the St John’s Stone has a myriad of attached legends. One states that the stone was frequented by fairies, who would come and dance around the long rectangular pillar of sandstone at sundown. There was an ancient custom that continued up until the 19th century of paying an annual visit to the St John’s Stone on St John’s Day (Midsummer’s Day – June 24), where a festival was formally held there. According to the historian Charles Bilson, this festival was “a vestige of old fire or sun worship”. Interestingly, parts of the ancient St. John's Stone now sit inside St. Luke's Church in Stocking Farm, Leicester. 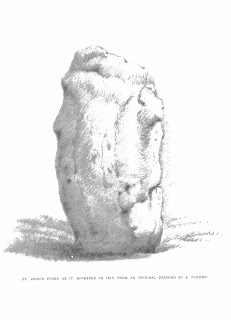 Mr J Plant, a geologist and member of the British Association for the Advancement of Science, states that “both the Humber Stone and the St John’s Stone are on the rise of the land, and visible from either locality if a fire was lighted on each at night”. Also interesting to note is that one of the “artificial” grooves on the top surface of the Humber Stone, lines up precisely with the direction of the St John’s Stone. 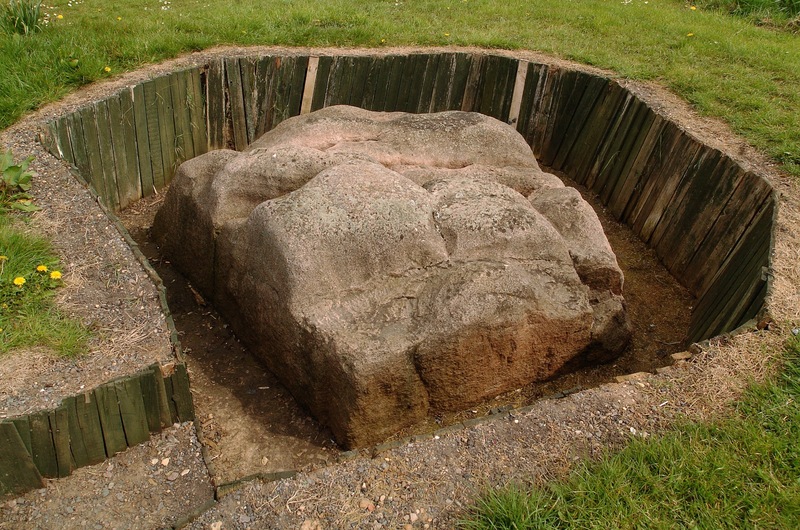 Those that have studied Leicester’s two largest monoliths – such as Charles Bilson and John Dudley – believed that the Humber Stone was artificially positioned and was a mark stone, pin-pointing sunrise when observed from the St John’s Stone. It didn’t mark sunrise on Midsummer’s Day however, but on another important day on the pagan calendar – May Day (known as Beltain). 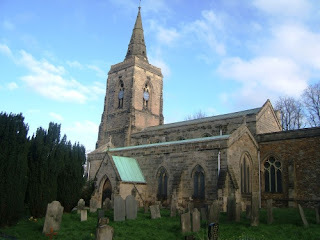 May 1 has a history of being celebrated in Leicestershire and the festival led to the naming of the village known as Mapplewell (May-pole well). TR Potter’s History of Charnwood Forest claims that “on this spot the Druids were accustomed to celebrate the Bel-Tain”. Beltain was also celebrated in Leicester, Ashby-de-la-Zouch, Hinckley and Croft. Maypoles were erected in most county villages such as Knossington. But most importantly for us, Beltain has always been an annual festival in the village of Humberstone. Pagan festivals such a Beltain, were astronomically important days for the ancients, and recently, many of the ancient standing stones found throughout Britain and Ireland have been proved to have originally been aligned to the sun, moon and stars. So it is feasible that the original purpose of the Humber Stone was to mark sunrise on May 1. After discussing the idea with author Graham Hancock, who unlocked the secrets of the great pyramids of Egypt, he gave me computer software which charted sunrise throughout history. Astonishingly, the only year when the sun rises directly over the Humber Stone on May 1, when observed from the St John’s Stone, is the year 3,200 BC. The idea may sound outlandish, for it would involve the precise positioning of a 20-ton boulder on top of a hill. However, history has showed us in the multitude of stone circles scattered over Britain that the ancients were capable of transporting much larger stones, over great distances, which in the case of Stonehenge, was from Wales to Wiltshire. The first stone circles of Britain and Ireland – such as the Castlerigg stone circle near Keswick, Cumbria – were built in 3,200 BC. The oldest human remains found in Leicestershire have been dated from 3,300 BC to 3,100 BC. So could the Humber Stone be one of these early feats of engineering? It is possible. It isn’t too much of a stretch of the imagination to picture ancient inhabitants of Leicestershire heaving the huge Humber Stone into position for the sacred purpose of marking one of the four most important festivals on the pagan calendar – the ancient May Day celebration known as Beltain. And remember the little boy who lived near the Humber Stone, who drew a picture of a horned being that came to the bottom of his bed? The ancient Beltain festival of Britain began with the May Queen slaying, none other than the Horned God. Good point. Typical of this town to allow this sort of thing to happen without the research being carried out beforehand.